As for AC Adapter, Is a Higher Power One Always Better? When purchasing a replacement AC adapter, we have learned that higher power one comes to be more expensive than others. Indeed, a HP adapter of higher output power can provide enough energy to battery and laptop more rapidly. For this reason, more and more users become to pursue for higher output power nowadays. 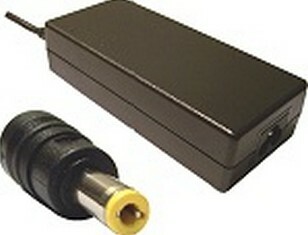 AC adapter is a switchboard to transmit the mains supply to dominated charging value. In the process of charging, the current increases in a short period as long as the output voltage has reached the steady state. Comparatively, if with the same output voltage, laptop can get more energy per minute to meet the requirements of all the components. However, as to the adapters with different output voltage, the situation comes to be more complex. In theory, the power of AC adapter is related with both output current and voltage. It is not until the charging voltage reaches a certain value that the current begins to increase. For instance, as both are 65W HP adapter, HP 402018 001 is lower than hp-oq065b83 in voltage. Comparatively, even if the working power is the same in surface, the former one can obviously last longer and charged more rapidly. Meanwhile, there’re some poor-quality AC adapters, such as refurbished AC adapter. Although it is normal to have a few differences between the actual value and the dominated value, it is very dangerous to users if the difference is large. In addition, a poor-quality one is with larger internal resistance. Compared to a normal adapter, it will be much hotter at work. Furthermore, a higher output power AC adapter is also not so good to environmental protection. As it works ceaselessly, it will consume much more energy from external power supply. Certainly, if it is necessary for your work, please keep it. Otherwise, never blindly pursue for high output power when purchasing a new replacement for your HP adapter.